The scope of this website includes Bachmann's HO-scale rolling stock from the introduction of the 1/87th line in 1970 thru 1995. The rolling stock presented in the 1995 catalog was the final year, prior to the upgrade to Silver Series. Bachmann begins its rolling stock line in HO-scale in the 1970 catalog. That year, Bachmann introduces seven different cars to its line of HO-scale trains. The first rolling stock group consists of a 41' Steel Box Car, 42' Steel Gondola with Gravel Load, a 42' Open Quad Offest Hopper, 42' 3-Dome Tank Car, 48' 200-Ton Flat 16-Wheels, 36' Steel Off-Center Cupola Caboose, and 56' Center Flow Hopper. For 1972, Bachmann adds seven more rolling stock selections: 41' Mechanical Steel Reefer, 41' Hi-Cube Box Car Smooth Sides, 51' Mechanical Steel Reefer, 51' Steel Plug-Door Box Car, 51' Flat Car with Loads, 58' All Doors Box Car, and 57' Cable Dispenser Car. The 1973 Bachmann still lists the 41' Mechanical Steel Reefer, 51' Steel Plug-Door Box Car, and 51' Flat Car with Loads all as new items, though they appeared previously in the 1972 catalog. Appearing for the first time in '73 is the 41' Wood Stock Car. Please help support this site! Your donation via PayPal makes this site possible. If you've enjoyed your visit or found some information of value to you, please consider making a donation to help keep this web site available and updated! Thank You! 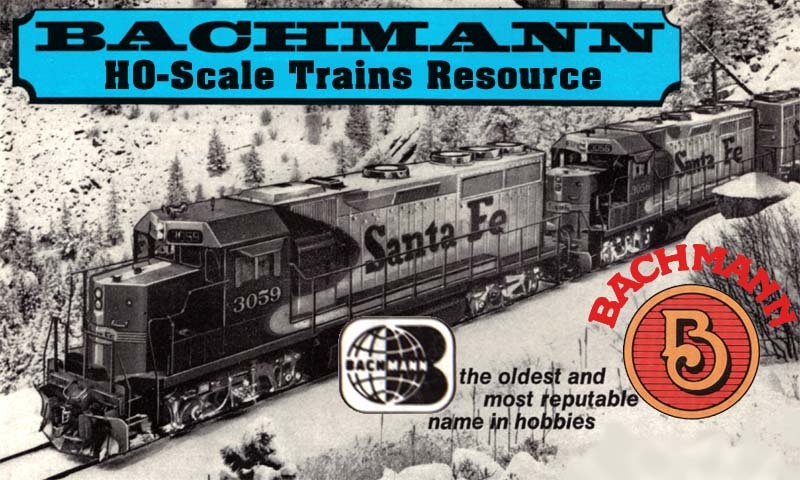 Please note that this site was created for use by those with an interest in HO-scale model trains and does not represent the current Bachmann line available today. The author is not affiliated with, nor representing Bachmann in any way. I do not have items available for sale, nor do I have information regarding repair or replacement parts, etc. This site is intended for your enjoyment and information only. 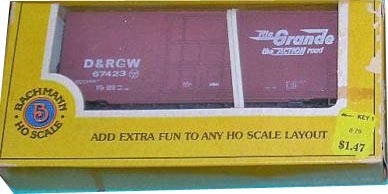 Please note that this site was created for use by those with an interest in HO-scale model trains and does not represent the current Bachmann line available today. The author is not affiliated with, nor representing Bachmann in any way. I do not have items available for sale, nor do I have information regarding repair or replacement parts, etc.